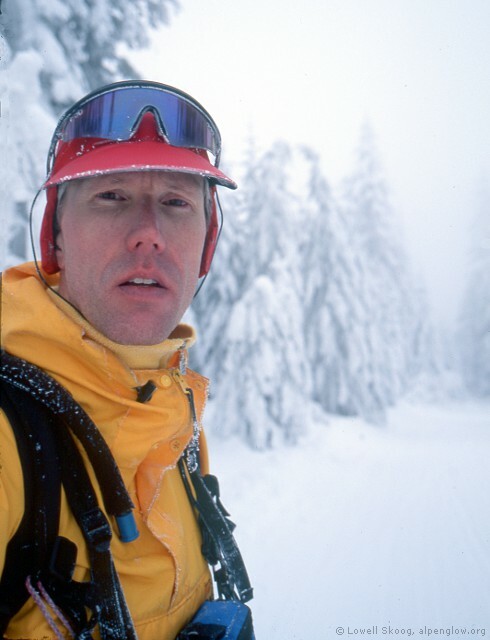 During the fall of 2000, I began a long-term project to research and document the history of human-powered skiing in Washington.� I started by reviewing the Mountaineer Annuals, and soon was engrossed in stories of the club's old Patrol Race, an 18-mile dash between Snoqualmie and Stampede Passes.� The race ran from 1930 through 1941, then stopped, apparently for good. Patrol Race trophies. 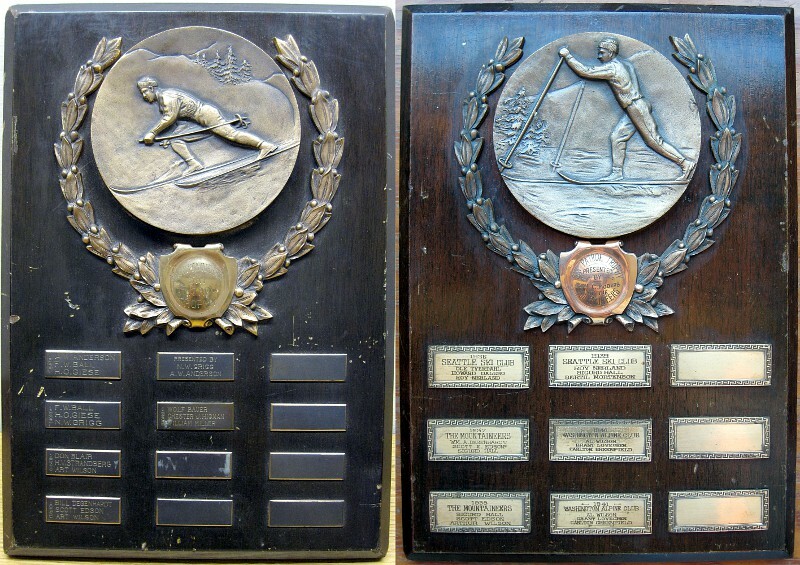 Left: Mountaineer club trophy awarded from 1930 through 1936. Right: Open Patrol Race trophy awarded from 1936 through 1941. I was intrigued by the stories I had read and inspired to follow the tracks of the old-time skiers to better understand their accomplishments. 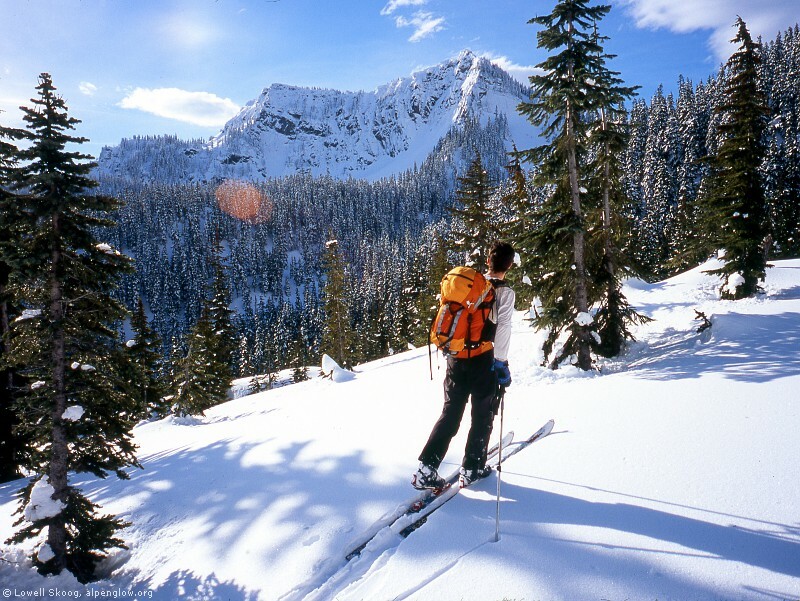 In January 2001, I scouted the north and south ends of the route on separate trips.� Then, on a cold, foggy day, I skied the route end-to-end, taking eight hours to navigate from Snoqualmie Summit and break trail to the Mountaineers Meany Lodge near Stampede Pass. Something about the route intrigued me. I felt transported in time and began to appreciate what skiing in the Cascades was like before there were rope tows.� In 2002 I tried to organize a Mountaineer outing to repeat the route with partners, but the trip had to be cancelled due to high avalanche hazard.� After the danger passed (and my party was disbanded) I repeated the route solo again as a consolation trip. These trips were done before the first Life-Link randonnee rally was organized in Washington (and well before Vertfest) so the community of skiers interested in covering distance without the prospect of good turns was small and poorly connected.� Though I had been a member of the Mountaineers for many years, I had never been active in the club. John Mauro follows the snow-covered Crest Trail toward Tinkham Peak in February 2004. In 2004, I put out a call on turns-all-year.com to repeat the Patrol Route with a partner. John Mauro contacted me, and we completed the trip on Washington's Birthday.� I came home from the trip with a new friend and some nice photos of the route, and I soon published a story on my website about it. 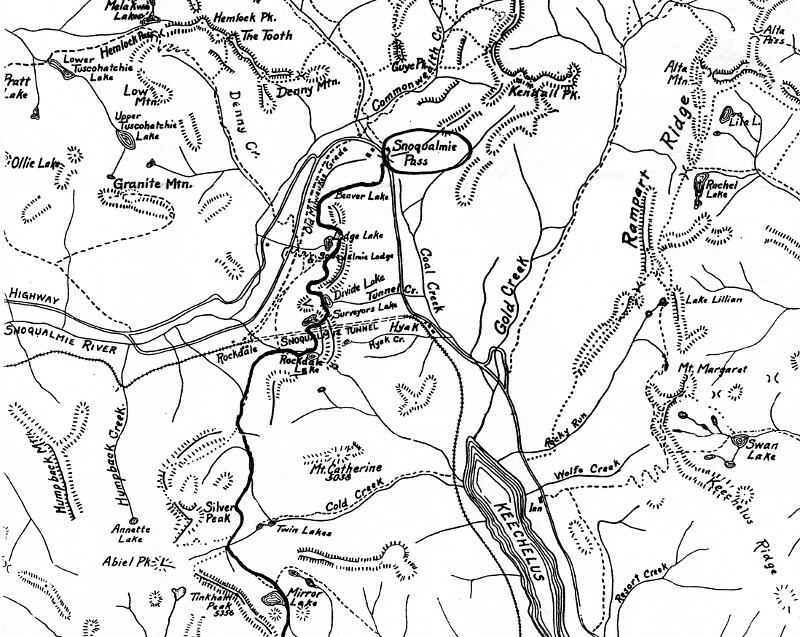 This led to an invitation from the Mountaineers to organize a reenactment of the old Patrol Race in 2005.� I didn't feel up to organizing a full-blown race, but I offered to lead a tour instead. The winter of 2005 was a snow drought and the tour had to be cancelled. We rescheduled it during the winter of 2006.� By this time, I had met and interviewed Wolf Bauer several times, and I'd published a profile of him in the Northwest Mountaineering Journal.� In 1936, Wolf's team set a course record for the Patrol Race of 4 hours, 37 minutes, and 23 seconds.� We invited Wolf to speak to our group at the "new" Snoqualmie Lodge (between Summit Central and Summit West) the night before our tour.� This was a once-in-a-lifetime experience, as the lodge burned down a few months later. Brandon Kern skis across Mirror Lake during the first modern running of the Patrol Race in 2014. The 2006 tour satisfied my interest in the Patrol Race route, and I didn't ski it again for eight years.� In 2014, a new group of Mountaineer skiers spearheaded by Nigel Steere got serious about reviving the Patrol Race.� Nigel is an avid split-boarder and his family has been involved in the Mountaineers Meany Lodge for four generations. 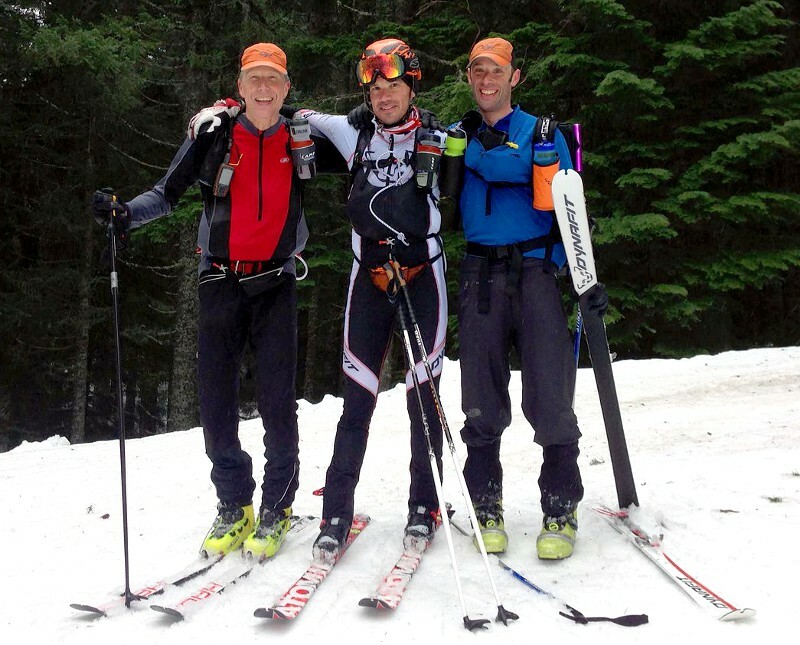 I consulted with Nigel on race planning and organized my own team with Seth Davis and Brandon Kern, two skiers I'd met at Vertfest rando rallies.� My teammates were eager to challenge Wolf Bauer's old record, but I was skeptical we could do it, perhaps jaded by too many slow trailbreaking trips. Ultimately, fate intervened. The night before the race, Seth twisted his knee skiing in a City League race at Alpental.� He was out.� Brandon and I skied the Patrol Race but were disqualified because we weren't a full team.� Our time of 5 hours, 39 minutes would have been been fast enough to win, and we realized that if we could eliminate a couple errors we'd made enroute, we might have a shot at the old record. Brandon Kern leading the way up Dandy Creek using a tether in 2014.� We found tethering helpful to link individuals into an energy sharing team. The winter of 2015 was another snow drought and the race could not be held.� For 2016, Nigel Steere organized the largest Patrol Race ever run, with 20 three-person teams competing.� Brandon, Seth and I signed up at our first opportunity and trained with enthusiasm.� I was worried about hypothermic conditions due to the rainy whether pattern leading up to the race.� But Saturday, February 27 proved just dry enough to enable us to ski without rain gear without getting soaked. With Seth and Brandon's slightly faster pace and my knowledge of the route, we moved well and made no mistakes this time. In the end we completed the route from Summit West to Meany Lodge in an official time of 4 hours, 52 minutes, and 7 seconds.� Based on timer and GPS data, our time from the old Lodge Lake start to Meany was 4:25:56, a little over 11 minutes ahead of the 1936 record set by Wolf Bauer, Chet Higman and Bill Miller. When I first skied the Patrol Race route alone in 2001, the achievements of Wolf Bauer and his friends seemed almost super-human.� To honor Wolf by challenging his record has been the fulfillment of a 15-year dream.� Wolf died just over a month ago at 103 years of age.� His Patrol Race record outlived him, and I knew him well enough to know that this would have been a great satisfaction to him. Southern half of the Patrol Race route. The race ends at Meany Ski Hut (now called Meany Lodge) near the abandoned railroad townsite of Martin. Congratulations you guys! It was a rainy day, and did not seem like a day for records. It does not seem possible to travel that far over such demanding terrain in such a short time, an exceptional effort! Next year: leather boots, wooden skis and wool sweaters. I'd join you for that! Great report Lowell - it is really neat to see you passion for this route and we really appreciated the articles that you shared during the awards. After the results from the first year (when you and Brandon ran the "modern" route as a twosome) I was skeptical that Wolf's record could be equaled. Here's to a great Patrol Race in 2016 and the beginning of a rekindled tradition! At any rate, I remember that one year I raced the whole 18 miles with a brick in my pack which some of my prankster "friends" had slipped in after the pack was weighed by the officials. The night preceding one of these grueling tests would be a scene of much activity, speculation and secret planning at the old lodge.� Theories on everything from ski wax to fad diets were discussed with passionate partisanship.� There were those who asserted that you raced on the dinner you ate the night before and, according to them, the less breakfast eaten, the better; those of the hearty breakfast school of thought brought their own lamb chops, steaks, or whatever they figured would best energize them for the long trek across. On the morning of the race the trail breakers were aroused and fed about four o'clock and were soon on their way, headlights penetrating the darkness.� Races have been run in rain, through deep, fresh snow and on death� defying crusty conditions.� Once a race was scheduled, it was run! The Patrol Race, instituted in 1930, soon became one of the highlights on the club racing calendar.� Its early appeal probably stemmed from the adventurous and sometimes "expeditionary" aspects of the event, as Fred Ball and others can reluctantly be made to testify.� To many, also, appealed the beauty of the region between our lodges.� These three-man team races were run at the speed of the slowest member, thus allowing at least half of the participants to negotiate the course under comparatively moderate effort and enjoyment.� Exceptions could be cited in the case of two unwitting stalwarts who carried rocks and bricks in their rucksacks all the way across.� These desperation methods failed, however, to achieve their purposes.� That one of these victims should turn out to be Paul Shorrock was a more or less foregone conclusion to anybody but him.� Hans� Otto Giese never did find out who-dun-it. Numerous racing anecdotes could be recounted, many of which now seem as hilarious and funny as they were serious and embarrassing at the time. 1. The longer time was published in both the Seattle Times and Seattle P-I immediately following the race. 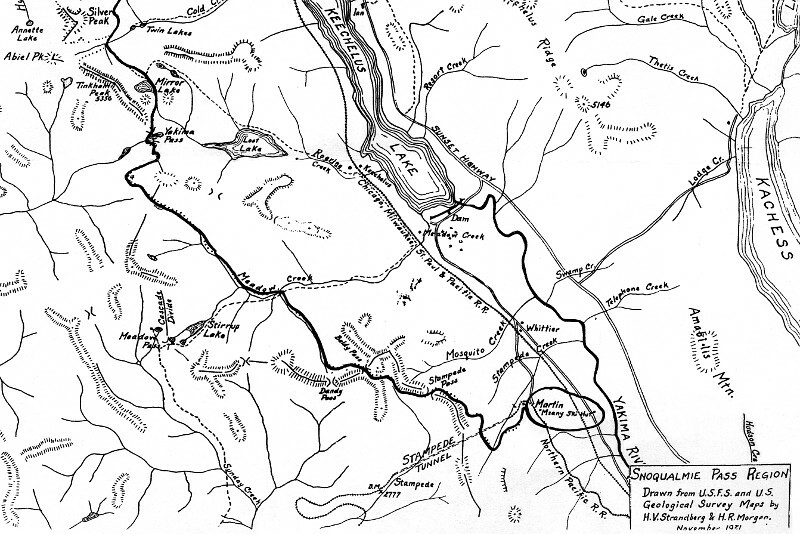 It was also published in the Mountaineer monthly Bulletin within one month of the race. In the March 1936 Bulletin, it is said that the new record lowered the old record by nearly 55 minutes. 2. Both the Times and the P-I wrote that the former record was 5:32. (I'm not sure which year that refers to, because I haven't found written documentation of that specific time. The closest result to that time that I've found in Mountaineer publications is 5:35:22, which was recorded in 1935. There are several years where I have not found a record of a time, and the 5:32 record may have been set during one of those years.) If true, this would provide further evidence that 4:37:23 is the correct new record, based on the statement in the March 1936 Mountaineer Bulletin that the new record "lowered the old course record by nearly 55 minutes". 3. The shorter time was published in the Mountaineer Annual near the end of the year of 1936. My theory is that this was an editing error introduced in the Annual. Note that the annual says this shorter time was "nearly an hour faster than the old record." That statement is inconsistent with an old record of either 5:32 or 5:35:22. If the new record was truly 4:27:23, then it would be MORE than an hour faster than the old record. To me, this reinforces my theory that the 4:27:23 figure is a typo. Happily, Seth, Brandon and I skied from the old Snoqualmie Lodge site to Meany Lodge in less than 4 hours, 27 minutes, so regardless of what the former record really was, we bettered it. At the end of the awards program at Meany Lodge on Saturday, several of us sang an old 10th Mountain song to celebrate the event. The video features my teammates Seth and Brandon, as well as a third friend, Ian Mackie, skiing powder at Snoqualmie Pass. And winter has come now at last. Two boards upon cold powder snow, Yo-ho! What else does a man need to know? That's all that a man needs to know. You cannot imagine a spill! The smooth shining track on the hill. There's two splintered skis in your hand. Two boards and some snow down your neck, Oh heck! Your skis are a hell of a wreck. And I'm free in the mountains alone. Nigel and team, Thanks for putting on such a great event. It is a special route ending in a special place. Next year our whole family is coming to make turns on the Meany rope tows! The Mach rope tow is impressive! 2. Both the Times and the P-I wrote that the former record was 5:32. (I'm not sure which year that refers to, because I haven't found written documentation of that specific time. The closest result to that time that I've found in Mountaineer publications is 5:35:22, which was recorded in 1935. Where are several years where I have not found a record of a time, and the 5:32 record may have been set during one of those years.) If true, this would provide further evidence that 4:37:23 is the correct new record, based on the statement in the March 1936 Mountaineer Bulletin that the new record "lowered the old course record by nearly 55 minutes". How much advantage do you reckon modern gear gave your team Lowell? I'm not nearly as familiar as you with the old gear, but I have to think that it was a lot heavier than what you had? I think modern gear provides an advantage, but it's hard to say how much. Wolf's 1963 recollections say they used "narrow cross-country racing skis." They were probably still heavier than our light skimo gear. More interesting to me is the difference between using skins and using wax. They used wax in the old days. When it's working well, wax can be very fast, probably faster than any sort of skins. But I'm no good at waxing, so I can't say much more about it. Fine work, guys! A tremendous accomplishment and a fitting tribute to Wolf at the same time. Wolf's 1963 recollections say they used "narrow cross-country racing skis." They were probably still heavier than our light skimo gear. Turns out I have pictures of some of those skis. Bill Degenhardt's team won the Patrol Race in 1935 and 1937 (the years that bracketed Wolf Bauer's victory). Degenhardt was later President of The Mountaineers and Mount Degenhardt in the North Cascades is named for him. His Patrol Race skis are hanging in the Mountaineers Mt Baker lodge. A plaque on one of the skis identifies them as his Patrol Race skis. And here's a close-up of one of the bindings. These bindings are kinda cool because when you lift the toe bar, it raises some little wings that clamp down on the boot sole on either side of the toe. You can see some pins sticking up into the sole of the boot to keep it from slipping out of the binding when the clamp is down. I think there are two pins on each tow iron. It looks to me like those skis do not have metal edges, but my photos don't show this definitively. I think you should post a video of you guys singing that song. I'd love to, if I knew where find a video. Some folks were taking cell phone pictures, but I don't know if they were stills or video. I didn't keep track of who they were. If anyone has a video, I'd like to get a copy. Throw in my two cents about an awesome day in the mountains. Thanks to all the volunteers that worked so hard to make this happen, pretty awesome. And a big thanks to Nigel and Pat for getting this thing resurrected for what will hopefully be a continued PNW tradition for many years. Also, nice job to all the other teams that slogged 20 soggy miles and arrived with smiles at Meany. Gotta say, no other skimo race that I've been to offers hot showers, in house massage, amazing all you can eat food, and great company like the Patrol race does. I'll keep coming back as long as my teammates will tolerate looking at my skinsuit for 20 miles! Thank you for the great story Lowell - and thanks for reposting the stories you shared at meany as well. There's little doubt that without your passion and interest this would be off of most people's radar. I feel blessed to have been able to participate in such a cool event. Thanks for sharing the group shot of all of us jtack! I've been hoping that one of those would surface. � Can't wait for next year! I talked with my almost 100 year old Dad, Lonnie Robinson about skis, bindings and poles and wax tonight. He remembers the 1935 time period very well. He said he knew Wolf very well then. He also said there was a difference between the racers and the regular mountaineers (clearly Wolf Bauer made his mark in both camps), which he has maintained forever. He said his skis were Broderna Sandstrom, bindings were made by local Sid Gerber as were the poles in competition with the foreign imports. He knows all about that because he worked� for Gerber in 1935 cutting leather for the binding straps and pole baskets and straps. Gerber sold "crummy"( Dad's words) imported skis to Filson and they wanted to open a ski shop at that time so Dad then went there to be their ski pro, wrapping Christmas packages when the ski work was slow.� He also talked about waxes.� He said for that kind of race with different elevations and snow conditions the popular wax was "A24" probably like the old Swix blue but a little softer. He said it wouldn't climb perfectly but wouldn't ice up as it got colder.He taught me to wax when very young and when younger I would rather wax any day over skinning up, depending on the temperature range of the route. He talks endlessly about the finer points of waxing. As for weight I was also very aware that 1 pound on my feet was like 10 on my back. Dad says they cut out the middle of the heels in their boots to make race boots lighter, using a wood piece instead. He will be 100 in August and loves to talk about the old ski days.